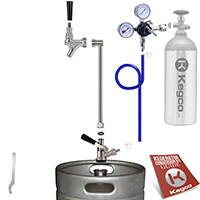 Throw the ultimate party with Kegco's Ultimate Party Pump Beer Dispenser Kit, which includes everything you'll need to dispense a keg of delicious cold draft beer whenever and wherever the party starts! Unlike traditional party pumps, this kit features a rod assembly that elevates the durable easy-to-use chrome beer faucet, allowing your guests to easily pour their own beers without the hassle of bending down to reach a low keg or continuously pumping a plastic faucet. Thanks to the CO2 dispense system, your keg stays fresher longer, letting you enjoy the rest of the beer even after the party's over. Like all of Kegco's kits, the Ultimate Party Pump Beer Dispenser Kit uses high quality commercial grade parts that have been designed and built to last, so you can enjoy great tasting beer party after party! Comments: Much better than a plastic hose laying around Keg. Easy to wash up. No over pumping which ruins the beer. Beer stayed fresh for days. Comments: Worked great at my brothers bachelor party. It sure is nice not having to pump. Comments: High quality material and workmanship. Very competitive price and on time delivery! Comments: I purchased this kit back in 2005 and today i'm still using it! I got tired of renting manual pumps from the beer store and decided to buy my own. I thought to myself, if I'm going to buy a pump for myself, I must buy a good one. This was the one I went with and I love it. Very easy to use and easy to clean. The only problem I have ever had with it was my fault, I lost one of the washers but that was really no problem, i just got a new one for less than a buck at home depot. If your out of co2 there are many places that will fill you back up, one time i even went to a paint ball store to fill it up. I upgraded mine, I converted it myself, I added another co2 hose and coupler with a flex hose for keg stands. I use the shaft side for the good quality beer and the flex hose side for the cheap beer for keg stands. Comments: This thing is AWESOME! It makes keg parties so much easier. I went through about 4 bronco pumps where somebody got drunk and pushed too hard and broke the plastic components so i decided to try something else. NO MORE PUMPING!!! That's got to be the biggest advantage. Once you've got your Co2 setup, you jsut pull the handle forward and push it back when your glass is full. It's like taking a bar with me to any party I got to. It's always a hit and makes getting a keg a much more pleasurable experience. I'm very happy with it!